Download "Oversight of payment and settlement systems"
1 Oversight of payment and settlement systems The efficiency of the financial system depends on the smooth functioning of various payment and settlement systems, because all financial transactions are performed through one or several payment and settlement systems. To ensure the smoothness of the financial system, it is necessary to keep various payment and settlement systems in line with the country s legal framework and to avoid disruptions that could have a negative effect on the country s financial system. The essence of payment and settlement systems Settlement systems mean infrastructure and the related legal framework that enables the settlement of mutual claims and obligations pertaining to cash and financial instruments. Payment and settlement systems include settlement systems aimed at settling mutual claims and obligations between the participants of the system (hereinafter settlement systems). They also include the different instruments of payment initiation (hereinafter payment instruments). The goals and necessity of various settlement systems are described in greater detail in Annex 1. 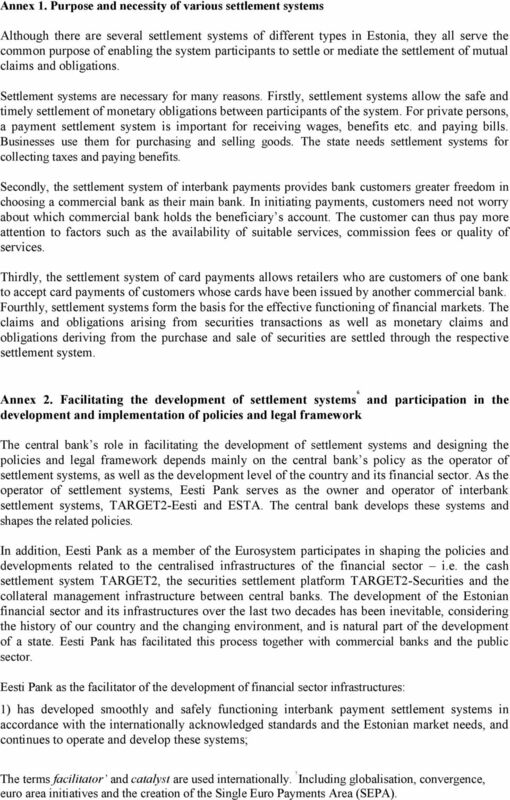 In Estonia, settlement systems include: Settlement systems of payments: settlement systems of intrabank payments, operated by the respective credit and payment institutions; the interbank payment and settlement system managed by Eesti Pank and which, in turn, consists of different settlement systems, including the TARGET2-Eesti component system and the Settlement System of Ordinary Payments (ESTA). the settlement system of card payments, operated by Nets Estonia AS; the interbank direct debit system managed by AS Itella. 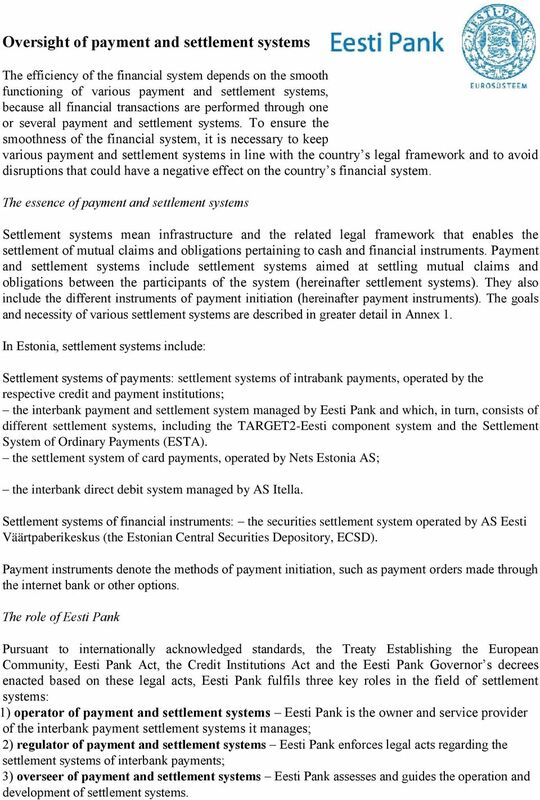 Settlement systems of financial instruments: the securities settlement system operated by AS Eesti Väärtpaberikeskus (the Estonian Central Securities Depository, ECSD). Payment instruments denote the methods of payment initiation, such as payment orders made through the internet bank or other options. 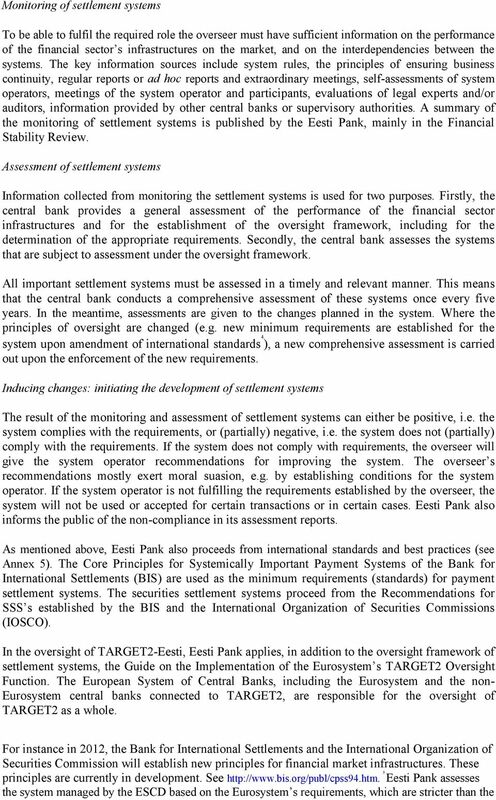 The role of Eesti Pank Pursuant to internationally acknowledged standards, the Treaty Establishing the European Community, Eesti Pank Act, the Credit Institutions Act and the Eesti Pank Governor s decrees enacted based on these legal acts, Eesti Pank fulfils three key roles in the field of settlement systems: 1) operator of payment and settlement systems Eesti Pank is the owner and service provider of the interbank payment settlement systems it manages; 2) regulator of payment and settlement systems Eesti Pank enforces legal acts regarding the settlement systems of interbank payments; 3) overseer of payment and settlement systems Eesti Pank assesses and guides the operation and development of settlement systems. 3 as a member of the European System of Central Banks, participates in the oversight of international settlement systems. 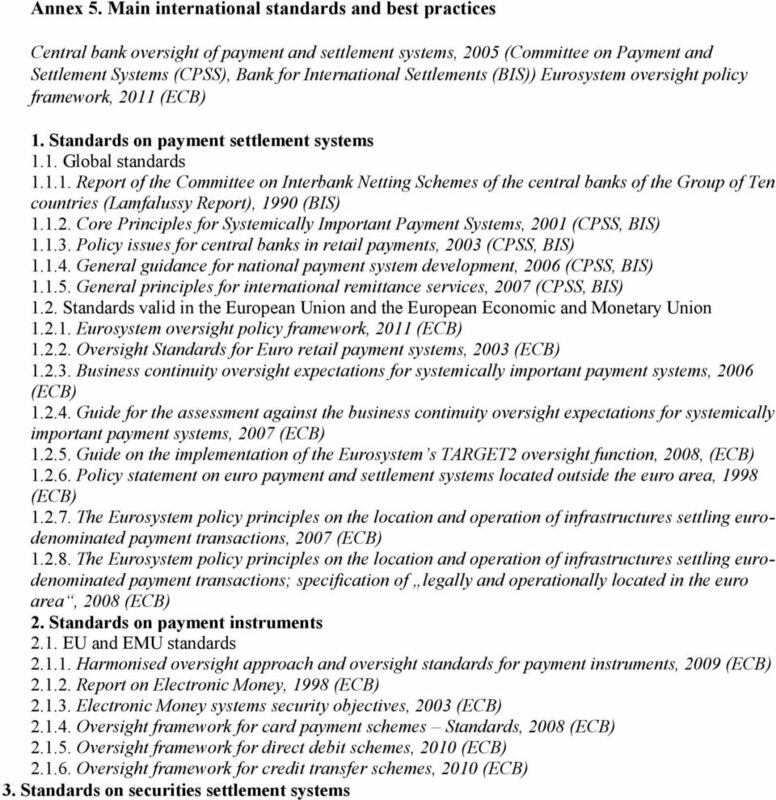 To this end, a Memorandum of Understanding on settlement systems has been concluded between the European Union central banks and banking supervisors in 2001, as amended in Oversight process The oversight of payment and settlement systems means that the central bank monitors the existing systems as well as those being developed, and assesses their compliance with international and the central bank s requirements. Where necessary, the central bank gives recommendations on how to enhance the efficiency and security of the systems. Settlement systems oversight is an ongoing process where, at first, the relevant principles or policy is formulated (see Figure). Arising from the principles, the central bank monitors and assesses the market and systems, and employs various measures to intervene in the functioning of the systems, where appropriate. Then the process begins anew, the difference lying in the correction of the relevant policy at the beginning of the process cycle, based on market needs and the general economic development of the country. Figure. 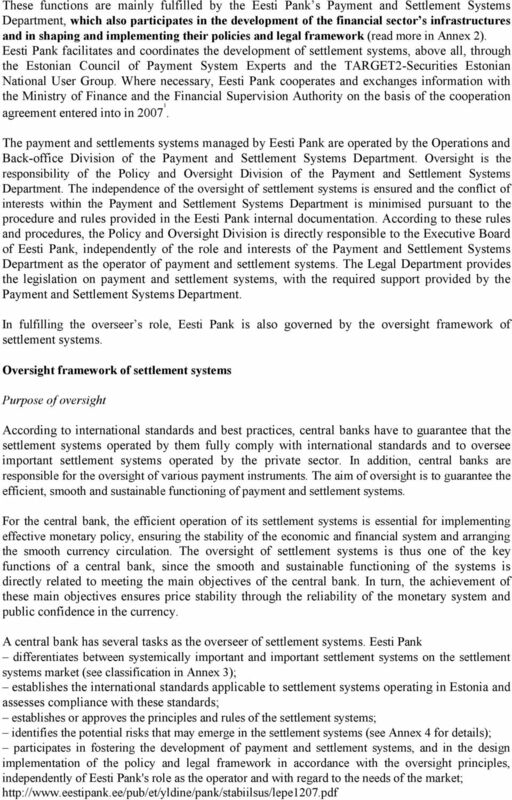 Oversight process of settlement systems Eesti Pank conducts oversight of all important and systemically important payment and securities settlement systems. This means that the systems must correspond to the central bank s policy goals 3 and expectations with regard to settlement systems, as well as to international requirements. Important settlement systems include the TARGET2-Eesti component system and ESTA, operated by Eesti Pank, and the securities settlement system operated by the ESCD. In the oversight of the securities settlement system, Eesti Pank is cooperating with the Financial Supervision Authority pursuant to the cooperation agreement concluded in Operating reliable and well-functioning payment systems. 5 recommendations of BIS/IOSCO. The European Central Bank plays the lead role in the oversight of the TARGET2 Single Shared Platform. As the TARGET2 component systems are legally and operationally decentralised, the main responsibility for the oversight of the TARGET2-Eesti component system lies with Eesti Pank. In overseeing the settlement systems, the central bank pays attention to the following aspects: the operational structure of the settlement system (the system s technical solution and operational reliability); the legal framework of the settlement system (legislation, regulations and system rules); risk awareness (risks in the system and for the system participants); risk management (risk measurement, monitoring and the reduction of excessive risks); business continuity; the efficiency of the settlement system; availability of the system; governance of the settlement system. 6 Annex 1. Purpose and necessity of various settlement systems Although there are several settlement systems of different types in Estonia, they all serve the common purpose of enabling the system participants to settle or mediate the settlement of mutual claims and obligations. Settlement systems are necessary for many reasons. Firstly, settlement systems allow the safe and timely settlement of monetary obligations between participants of the system. For private persons, a payment settlement system is important for receiving wages, benefits etc. and paying bills. Businesses use them for purchasing and selling goods. The state needs settlement systems for collecting taxes and paying benefits. Secondly, the settlement system of interbank payments provides bank customers greater freedom in choosing a commercial bank as their main bank. In initiating payments, customers need not worry about which commercial bank holds the beneficiary s account. The customer can thus pay more attention to factors such as the availability of suitable services, commission fees or quality of services. Thirdly, the settlement system of card payments allows retailers who are customers of one bank to accept card payments of customers whose cards have been issued by another commercial bank. Fourthly, settlement systems form the basis for the effective functioning of financial markets. The claims and obligations arising from securities transactions as well as monetary claims and obligations deriving from the purchase and sale of securities are settled through the respective settlement system. Annex 2. Facilitating the development of settlement systems 6 development and implementation of policies and legal framework and participation in the The central bank s role in facilitating the development of settlement systems and designing the policies and legal framework depends mainly on the central bank s policy as the operator of settlement systems, as well as the development level of the country and its financial sector. As the operator of settlement systems, Eesti Pank serves as the owner and operator of interbank settlement systems, TARGET2-Eesti and ESTA. The central bank develops these systems and shapes the related policies. In addition, Eesti Pank as a member of the Eurosystem participates in shaping the policies and developments related to the centralised infrastructures of the financial sector i.e. the cash settlement system TARGET2, the securities settlement platform TARGET2-Securities and the collateral management infrastructure between central banks. The development of the Estonian financial sector and its infrastructures over the last two decades has been inevitable, considering the history of our country and the changing environment, and is natural part of the development of a state. Eesti Pank has facilitated this process together with commercial banks and the public sector. Eesti Pank as the facilitator of the development of financial sector infrastructures: 1) has developed smoothly and safely functioning interbank payment settlement systems in accordance with the internationally acknowledged standards and the Estonian market needs, and continues to operate and develop these systems; The terms facilitator and catalyst are used internationally. 7 Including globalisation, convergence, euro area initiatives and the creation of the Single Euro Payments Area (SEPA). 8 cause unforeseeable financial losses to the operator or participants of the settlement system. The realisation of the legal risk could, in turn, lead to the realisation of credit or liquidity risks. Security risk or the risk that fraud or misuse of the system will harm the functioning of the system. 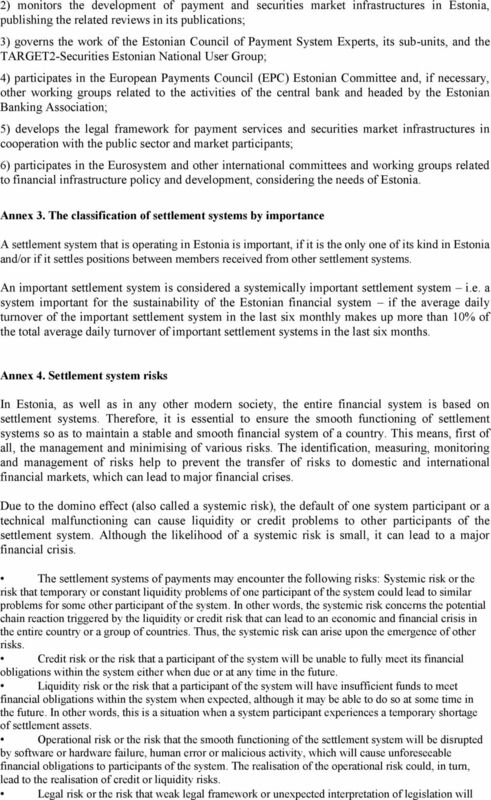 Risks related to settlement systems of securities: All the above-listed risks of settlement systems. Custody risk or the risk that the custodian does not keep separate books for its own securities and the securities of its customers. In other words, it is the risk that the custodian would carry out transactions with the securities of its customer without the latter s knowledge.